Use the form at the right to let me know about your event. I will respond to you shortly. Take a look at what others have experienced when they have decided to go with Pro City DJ! It's so important to choose the right DJ for your special wedding, party or event. Please enjoy reading some Pro City DJ reviews. When clients take the time to express their satisfaction in a review it's a special thing. My commitment to you is to provide you the very best service with all of my energy, talent and intent. You may have found my DJ profile on Thumbtack.com and have navigated here to look at Reviews from previous Pro City DJ clients. 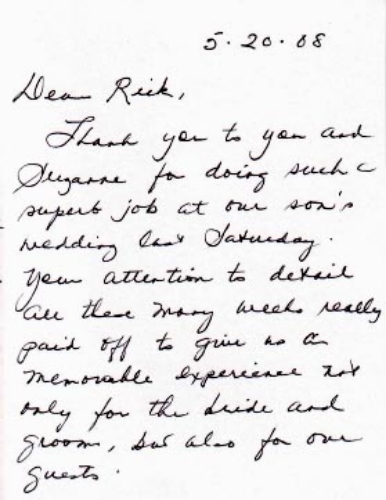 Very special reviews from clients who took the time to hand write a note and mail in! Beautiful out door wedding ceremony at the 12 Bridges country club North of Sacramento. Nice to please Mom too! Was my honor and pleasure to DJ for the annual Autism Speaks Walk for 3 straight years before moving to So. Cal.